1. 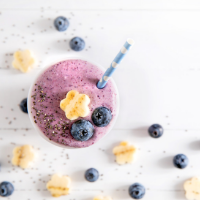 Blend the Wild Blueberries, ½ cup milk, oats, yogurt, vanilla, cinnamon, 2 teaspoons honey, and ice together in a blender until smooth. 2. Divide it equally between two glasses. 3. Blend the peaches, ½ cup milk, 1 teaspoon honey and the lemon juice together in a blender until smooth. If using frozen peaches, you may need to add a little additional milk or water to get the blender going. 4. 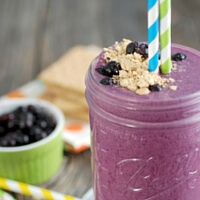 Carefully pour equal amounts into the glasses on top of the frozen Wild Blueberry layer, creating a second layer. 5. 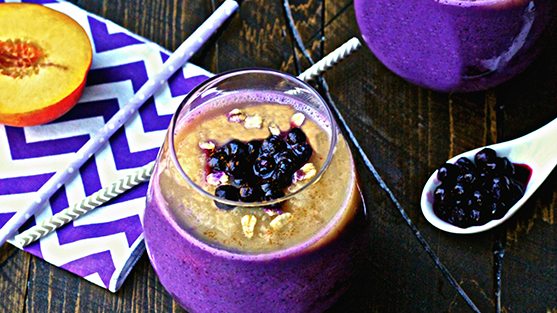 Garnish the smoothie with frozen Wild Blueberries, oats, and cinnamon.